This book explores the most remote habitats on the planet. From the intimate view of a cheetah's care of her six cubs in Africa to a carpet of Emperor Penguins in Antarctica to a robotic landing of 25,000 turtles on an isolated Costa Rica beach, this personal narrative captures the wonder, beauty, and fragility of vanishing wild places. During four decades, Greg and Mary Beth Dimijian ventured into the back country of Earth by land, sea, and air to photograph and savor the adventures shared in this book. From the searing heat inside a volcano in Hawaii to the grandeur of the continental divide in Glacier National Park and the mystery of a coral reef during a night dive, their stories reflect a love of learning about fascinating inhabitants of the planet and a passion for adventure. 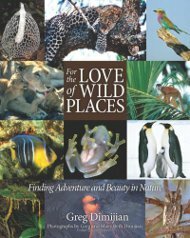 For the Love of Wild Places inspires readers with a renewed motivation for exploring and saving the remaining wonders of Planet Earth. Photographs lure readers to sights and scenes that echo a resounding message: If you treasure wild places, go now before they disappear.